For years I have observed people succeed and fail with money and there is no doubt about it: The primary reason people fail with money is that they do not know how to get in control of their money. This Is The Most Important Thing You Can Ever Learn About Money. When I say that this is the most important thing you can ever learn about money, I realize that I am making a very strong statement. But I am not concerned at all that it may be an overstatement. Not a bit. In these five articles you will learn exactly why most people find it impossible to achieve this goal and you will learn how you can do it successfully. The exciting reality you will discover here is that it is not difficult! It is primarily a matter of rightly understanding the problem and adopting a simple plan to get into control of your money. I will show you just how to do it. Many others have. You can, too. There are five articles in this series and each one tackles a distinct part of the solution. Please read each one carefully. I am confident that with this help anyone who wants to can get in control of their money and start moving toward financial success. The information in this article may shock you! After reading this information you are almost certain to discover that what you need to do to change your life around is incredibly less than you expect. Suddenly it will become more of a simple decision about the way you are managing your affairs than a great and seemingly unsurmountable obstacle. You do not need to be an accountant to succeed financially. However, there are certain numbers you need to be aware of if you want to keep moving in the right direction. Here is what you really need to know and how to use that information. In this article we look at the importance of deciding on purpose how we will use our money. And we will see how important it is to write it down. When done intelligently this will not really limit anything; instead it will help us remove limitations that are already being imposed upon us. It will become a planning tool, not a restriction. The primary reason that people cannot control their money, at its heart, is that there are no mechanisms in place to see that their money is used as they choose to spend it. Most people just put their money into a checking account and use it as “needed”. Usually the money runs out before the end of the month! At the very center of your plan for controlling money is a structure for dispensing your funds according to your own personal plan. This arrangement can take many forms, but in the end they all physically direct the money to the place you want it to go. 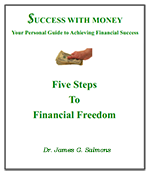 As a result you will be in control of your money rather than letting it be in control of you. Finally, in the last article, we look at the long term application of this process. Patience and persistence are required to methodically apply these ideas to our lives. It is important to see how these practices must be slowly applied and adjusted over a period of several months to achieve their full potential. Getting in control of your money in and of itself accomplishes little toward achieving your financial goals, yet it is the most important part of financial success. Without doing this first you will never manage to start spending less than you make, pay off your debts, or start saving and investing. Don’t stop here, but don’t pass by here either without taking the necessary steps to get in control of your money. Achieve this and everything else will be easy; fail here and nothing will be possible at all.